A very tough day of surfing for day 3, the final day of competition for the 2014 Kirra Teams Challenge, held at Kirra Point, with howling Northerly winds battering competitors all day, and a heavy swell that was breaking from miles out the back of Kirra on the sets. With 24 heats left to run, the Contest Director called that the heats would be 20 minutes long with the best one wave counted for each surfer to determine heat winners. The surfers from every club competing across the final day, put on a brave and sometimes stella performance to thrill the crowd and often post some very high scores. 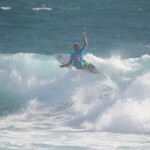 Overnight leader, Merewether Surfboard Club, started the final day in superb fashion in the first heat of the day, with a heat win by team rider Ryan Callinan. 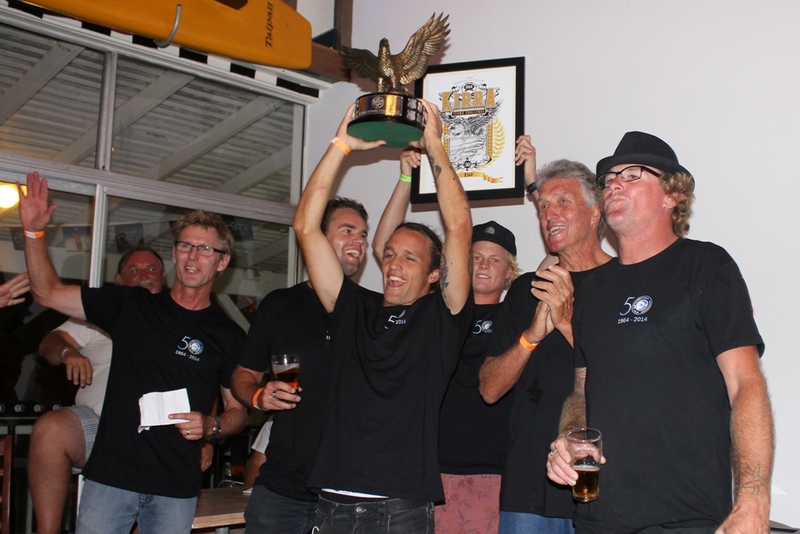 They then sealed their 2014 Kirra Teams Challenge victory by heat 57, the first heat of round 8, with their surfer Jesse Adams also winning. 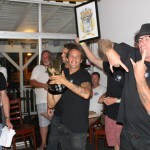 That win gave Merewether six first’s and two 2nd place finishes across all their heats during the three day event, which could not be matched by any other club. 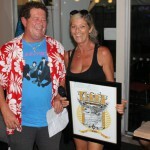 With seven heats remaining it became a fight for the runners up positions and minor placings and of course (semi) bragging rights over rival clubs until next year. 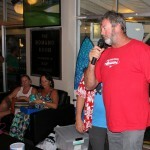 Event sponsor, Rainbow Bay SLSC was the venue for the presentation of the 2014 Kirra Teams Challenge. 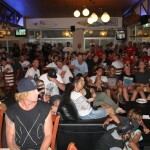 A big crowd turned out to learn the final team placings and to hear the speeches from event hosts, Kirra Surfriders Club, as well as the top 4 placegetters and to watch Merewether celebrate their win. 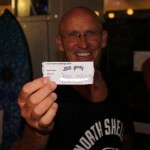 The Lost Mayhem board raffle was also drawn with a very happy winner in Luke Fielder from the North Shelly club also celebrating. With three wins, two 2nd’s and two 3rd place finishes the Kirra team placed 5th overall out of the 32 teams competing at the event. 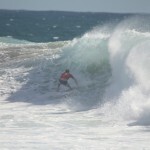 Perhaps the home ground advantage helped a bit with 2 of the 3 days of competition held at Kirra!! 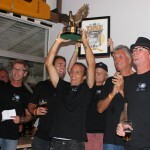 This result cemented the Kirra Surfriders Club team as the highest placed Queensland club of the event. 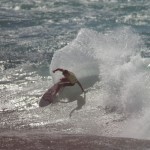 So a big congratulations to the Kirra team which consisted of Open Surfers; Corey Ziems, Asher Pacey, Mitch Duggan, Oscar Scanes, Adam Klink & Sam Clift and Junior (Under 21) Surfers ; Max Tobin & Blaine Robinson (both only 17yrs old). 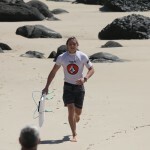 Thanks also to Davo for coaching the team through their heats across the 3 day’s of competition. A big thanks to Rob & John for running the event and to Jenny S, Bernie, Grace, Terry, Amy, Keld, Jenny G, Phil, Kaylee, Michelle, Brad, Smiley, Sharon, Chris and every other Kirra club member and volunteer who helped out with the setup, packup and running of the food tent across the weekend, to help make the event such a huge success. 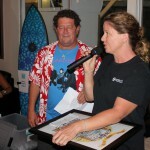 Finally thanks to our sponsors; Rainbow Bay Surf Club, Gold Coast City Council, Allstate Partners, Lost Mayhem and support sponsors Hannah’s Choice for your sponsorship dollars, product and other contributions to the event, which also helped to ensure its success. 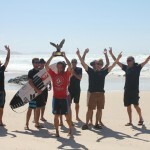 The next event to be hosted by the Kirra Surfriders Club will be the Kirra Junior Teams Challenge in September 2014 – so keep a lookout on our website for more info about that event by mid year.